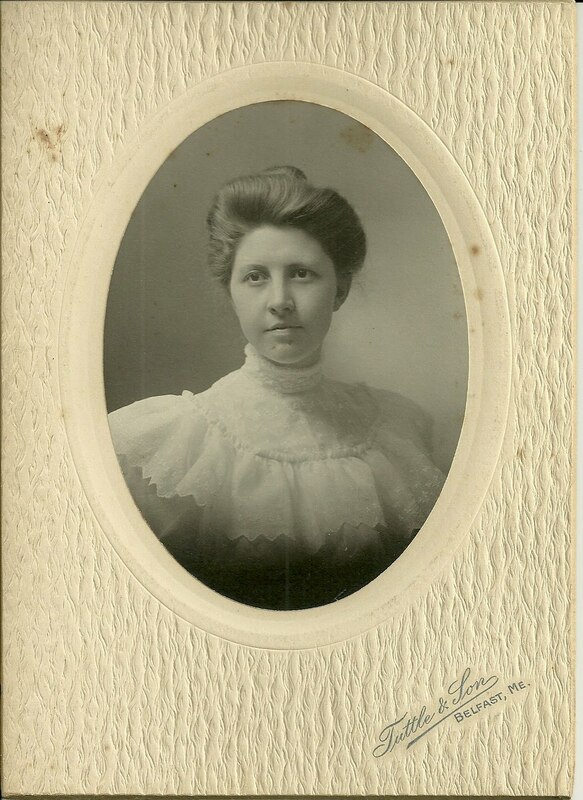 1905 graduation photograph of Maribeth Maria Jellison, or "Beth Jellison", at Eastern State Normal School in Castine, Maine. Her name appears in the annual review of Education in Maine, published by the Maine Department of Education in 1905, listed among that year's graduates at Eastern State Normal School, a class described by Albert F. Richardson, the school's superintendent, as the best class ever graduated. From online research, which is not always reliable, I found that Maribeth Maria Jellison was born in November 1879 in Maine, the daughter of Joseph Warren Jellison and his wife Carrie Susan (Wallace) Jellison. Joseph Warren Jellison was born abt 1854 in Maine, the son of Nahum Young Jellison and his wife Mary (Abbott) Jellison. Carrie Susan Wallace was born 7 March 1852 in Milbridge, Maine, the daughter of Albion Keith Parris Wallace and his wife Maria Sanborn (Wallace) Wallace. Joseph Warren Jellison and wife Carrie Susan (Wallace) Jellison had four children that I could find, Maribeth being the eldest. Joseph died in Florida about 1942; Carrie had predeceased him in Florida a couple years earlier. Tenants Harbor is the commercial heart of St. George, Maine, which is located in Knox County near Rockland. It's a beautiful area of ocean and island vistas. In the 1910 Census, Beth was living with her parents in St. George and was a teacher at a normal school. I'm not sure where the normal school was, but Castine was too far to commute on a daily basis. It's possible that she stayed in Castine during the week but maintained her residence at St. George. By the time of enumeration of the 1920 Census, Beth is no longer living with her parents, and I haven't yet found her in that Census or in the 1930 Census. I found one reference online where she died in 1938, but I have no proof of that. It's possible that she died earlier. I don't see a listing for her in the Maine Marriages online database, but she could have married out of state, if at all. She may have followed her parents and brother Chalmers Upton Jellison to Florida. Perhaps a reader can help fill in the blanks. Hopefully this heirloom will have special meaning for you. If you have any information on the Jellison or Wallace families of coastal Maine, I would love to hear your corrections and additions. Beth Jellison was my great aunt although I never knew her. She died before I was born (that 1938 date is correct). She was my mother's favorite aunt, a schoolteacher who never married. After my father came home (WWII) we had a flat in Salem MA for a couple of years. I went to kindergarten there and my mother sent me out of district to the Horace Mann Laboratory School of the Salem Normal School because a former roommate of Aunt Beth's, Miss Vera Knight, was the teacher. Later, when I was an undergrad at Salem State College (now University) I was exploring in the archives, looking for pictures of the kindergarten classroom to see if my memories of it were accurate. In a couple of yearbooks from the twenties I found Miss Knight - and also Aunt Beth! I had always assumed they were college roommates but Miss Knight went to school in Salem while Aunt Beth had been at Castine. Apparently they were roommates at a boarding house in Salem. Miss Knight was the Superintendent of Kindergarten - and Aunt Beth had been Superintendent of Sixth Grade! What that apparently meant was that, in addition to classroom teaching, they taught students at the normal school. In later years Aunt Beth moved to Kearsage NH where she roomed with a friend and fellow teacher whose name I don't know. When her parents became old and in need of care, she had them with her for a while. Later her brother Chalmers would take them to his place in Florida where he was able to hire a nurse to care for his mother. Later Chalmers, who had been thought to be a lifelong bachelor, would marry the nurse, a widow with a grown daughter. My mother remembered visiting Aunt Beth whose house was always immaculate - perhaps a trait she learned from the years of living in the lighthouse keeper's home. Mom said Aunt Beth was a no-nonsense sort of person, very kind and fairly strict. Aunt Beth's name was actually Maribeth Mariah but she hated it and always called herself Beth M. Jellison. She never wanted to marry and was apparently very happy in her small house in NH. I am so glad that she can be remembered here. So often our maiden aunts and bachelor uncles, with no children to remember them, seem to disappear unless they did something out of the ordinary in life. Thank you for that warm and informative comment! She may not have had children of her own, but she surely touched the lives of many.